Going into the Southern Wind Rivers is never an small feat, especially in May when there is not quite enough snow to drive to the trailhead or to skin the entire way in. On May 14th four of us headed down to the Big Sandy Ranch which is the ranch I have grown up on since I was 5 years old. I have grown up horse packing, backpacking and climbing in these mountains. Until last year I had never had the opportunity to ski these amazing mountains. I have always looked at different peaks and couloirs in the Deep Lake and Cirque of the Towers area. The skiing is endless! No more horses! Time to carry all our stuff! 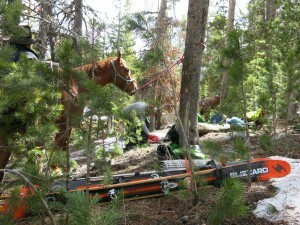 We met my dad and mom around 9 am at the ranch and packed up our supplies into the panniers. 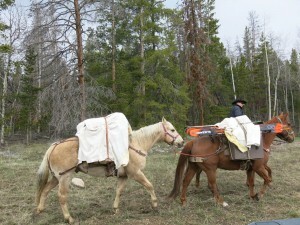 The plan was to horseback as far as we could along the Big Sandy Road until the snow did not allow. We trailered the horses about 6 miles up from the ranch and then packed all our gear including our skis and boots onto 2 pack horses. 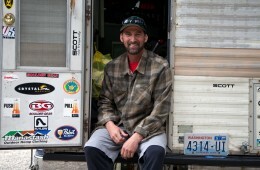 My dad then was able to make it 4 miles down the road and about 1/4 mile down the Big Sandy Trail. This was the end of the road of luxury travel. 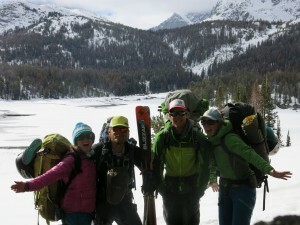 We packed our packs with 4 nights of food and ski gear. This made for pretty heavy packs to do the 7 mile walk to Big Sandy Lake. 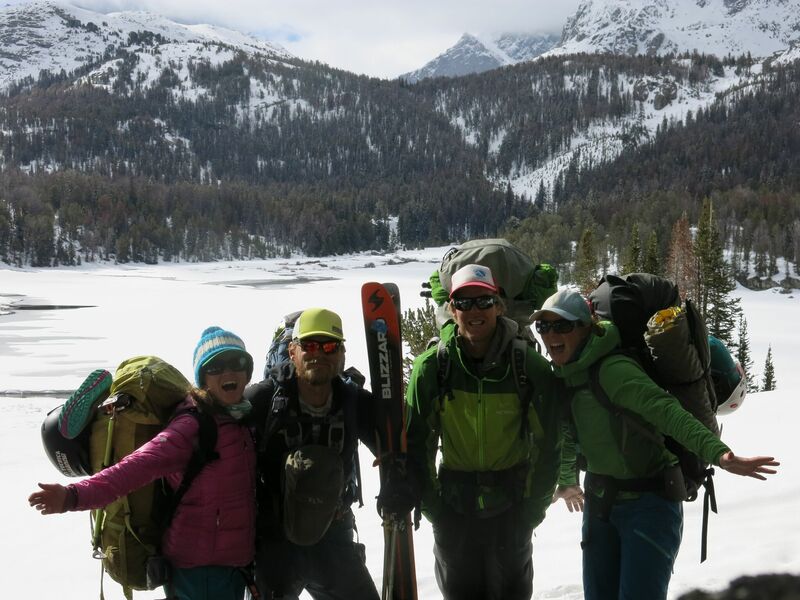 The trek took us around 4 hours, we dealt with isothermic snow the entire way and had to take our skis off multiple times until we reached around mile 4. We arrived to Big Sandy Lake just before 7 pm and just before some black clouds cam down on us. 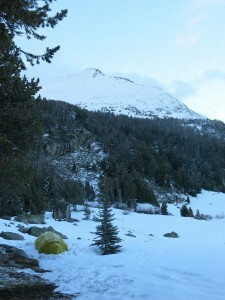 We never received rain the entire time we were in the Winds, but we did receive small squalls of snow 3-4 x a day. The next morning we awoke at 5 am, knowing that this day was probably going to be our only sunny day. Our objective was the Y Couloir on the north side of Temple Peak. As we left our camp we followed bear tracks to the base of our route. 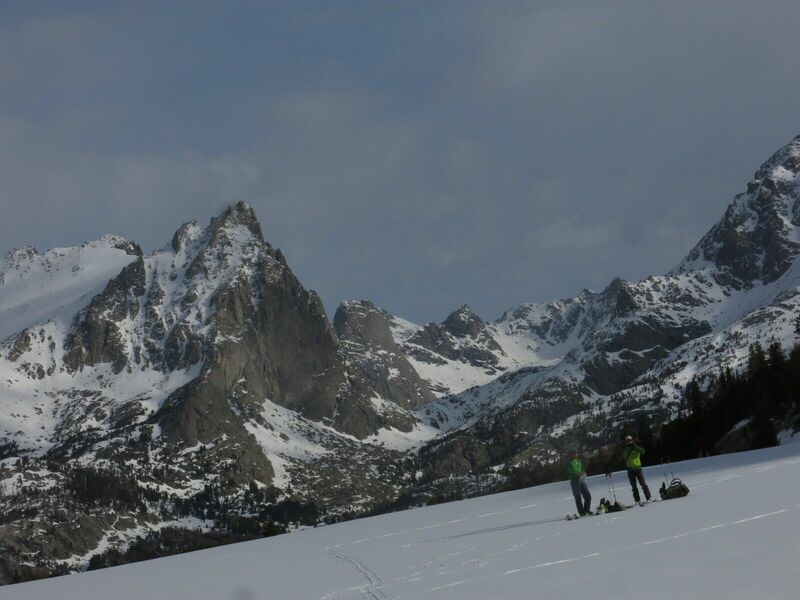 I had looked at this beautiful diagonal line for a while and was really excited to hopefully get to ski it. 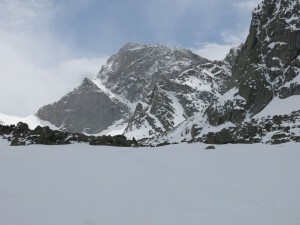 The couloir runs diagonal down the back side of Temple Peak and is small strip of snow above a lot of exposure. 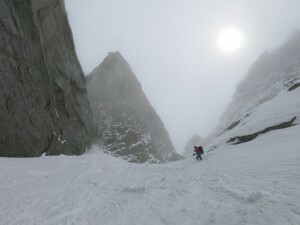 The couloir itself is not super steep, but the exposure is still incredibly eery. 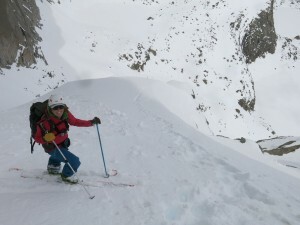 Booting up this couloir was a ton of work due to the depth of the new snow. The couloir was about 1500 ft of fun steep skiing! Looking at the Y couloir on Temple Peak. 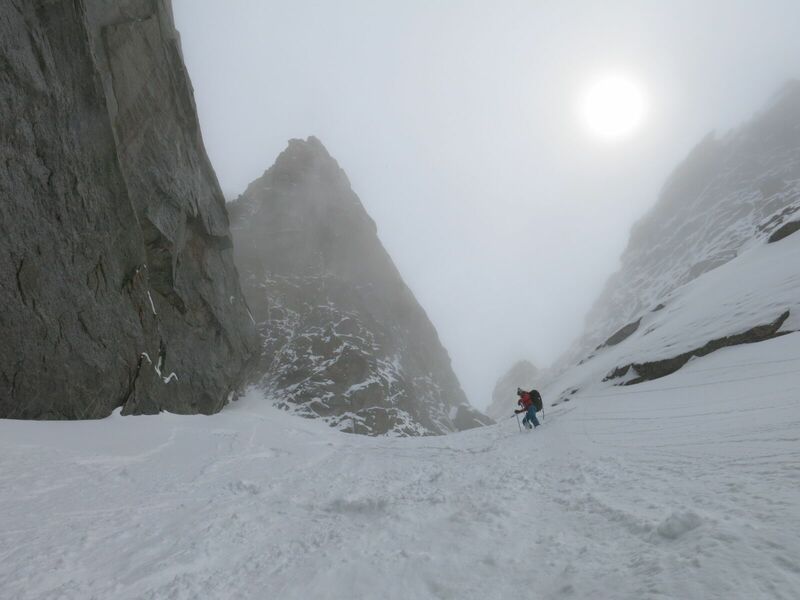 Looking down the Y couloir! The next morning we awoke at 5 to it dumping snow and decided to sleep in, when we finally climbed out of our tents around 8 am there was around 4 inches of snow on our tents and around camp. The weather had cleared a bit so we decided to head up into the Cirque of the Towers, the approach was just about an hour and when we came of the last saddle the views into the Cirque were amazing. Seeing this place covered in snow and knowing nobody is within miles of you is pretty surreal. 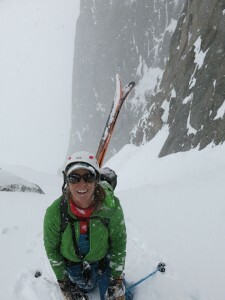 We decided to check out a North Facing Couloir that looked to be good snow, but only seemed that it went about 400 ft up. As we started to ascend the couloir the snow was perfect powder and it kept going an instead of 400ft we were able to ski around 1200 feet of pure bliss. 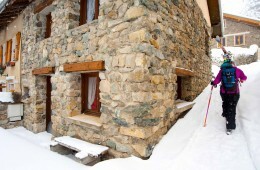 The couloir had beautiful big walls, we had some amazing skiing in May in a couloir we were unsure of existed. Skiing Back to camp we were all smiles! 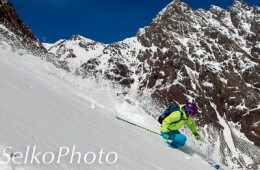 Hidden powder couloir in the Cirque! Getting ready to ski powder bliss! The weather had held enough for us to ski these two amazing lines. We new some bigger storms were coming in Saturday night so we decided to pack out a day early. Our packs a little lighter, but still pretty heavy we had to walk the road that the horses had brought us in on. We all were incredibly happy to see the truck! I am stoked to have checked a few more lines in the Wind Rivers off my list. Skiing in those mountains is incredibly peaceful, it is definitely my happy place! Can not wait to go back! Getting ready to hike out!